Since 2007, through generous funding by the National Science Foundation (NSF Grant No. DRL-1118897, DRL-0735657), the DevTech Research Group has been researching how to create a developmentally appropriate robotics construction set for young children in Pre-K through 2nd grade. 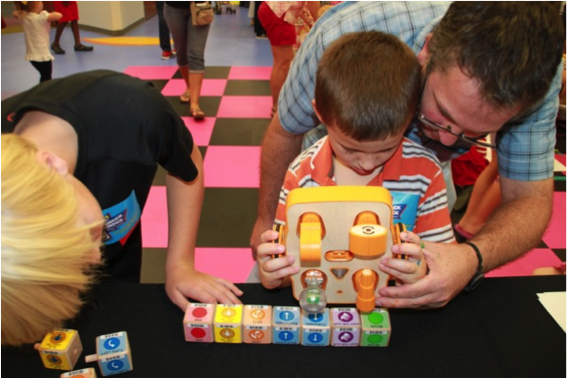 This grant paved the way to developing the KIBO robotics kit, now commercially available through Kinderlab Robotics. The KIBO kit includes: wheels, motors, light output, a sound recorder, and a variety of sensors (Sound, Light, and Distance sensors). KIBO is designed to work without any screentime using wooden programming blocks. 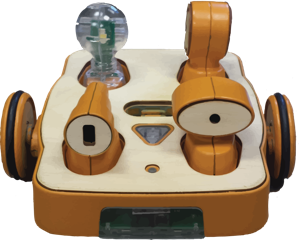 The KIBO robotics kit was developed through the Ready for Robotics project, led by Professor Marina Umaschi Bers from the DevTech Research Group at Tufts University and funded by the National Science Foundation (DRL-1118897). This research project focuses on two components of STEM, the “T” of technology and the “E” of engineering that have been the most neglected in early childhood education. As part of this project, we created and evaluated a developmentally appropriate robotic system for young children (ages 4-7), called KIBO (formerly known as “KIWI” or Kids Invent with Imagination), a robot that children assemble with motors, wheels, and sensors and then program with our tangible programming language made of wooden blocks. KIBO is now commercially available through KinderLab Robotics. Additionally, we have developed strategies for integrating its use in early childhood classrooms by designing curricular units that integrate programming and engineering with other subject areas, as well as professional development strategies. Since 2011, the KIWI prototype (now called KIBO) has gone through several design iterations and has been tested in numerous public and private schools in the greater Boston area as well as in summer camp and lab settings. This testing with children and teachers has informed each stage of the re-design of KIWI and the commercially available KIBO robotics kit. The image above displays the design changes made to the KIBO robot over the years beginning in 2011 (light blue, pictured far left) to the newest commercially available model (orange, pictured far right). Design changes were made based on ongoing pilot-testing and direct feedback from early childhood educators and children. KIBO is programmed using tangible wooden programming blocks- no screentime required! The child creates a sequence of instructions (a program) using the wooden blocks and KIBO reads the barcodes with an embedded scanner. With the press of a button children watch the robot come alive (see images below)! The KIBO programming language contains 21 unique blocks and 12 unique parameters leading to endless creative possibilities. To read publications related to these and other topics, please visit DevTech’s Publications Page. KIBO and its prototypes have been used as part of several Doctoral dissertations, Master’s Theses, and Undergraduate Theses. The DevTech Research Group hosts robotics and programming professional development institutes and workshops throughout the year. For more in-depth teacher preparation please see our Early Childhood Technology Certificate Program. Want your own KIBO? You can get one! The KIBO robotics kit is available online through KinderLab Robotics Inc.
Publications and Papers: For a list of publications related to the topic of robotics, please visit the DevTech Publications Page. Robot Parts Song Lyrics – This editable document includes lyrics to the Robot Parts song for KIBO and WeDo, but you can easily adapt it for any robotics kit. Sample Blank Engineer’s License – Editable word document that can be adapted. KIBO Puppets – Instructions to build your own KIBO puppets! KIBO Research Protocol Request – Fill out a form to request full access to DevTech research materials including: child assessments, teacher assessments, curricula, and more. KIBO Assessment Packs – KIBO Assessment Packs can be purchased here. 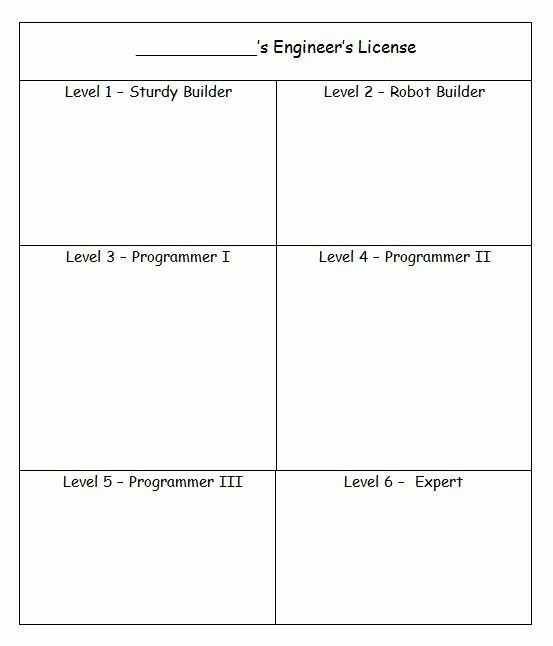 General Assessment Templates – Assessments for general robotics and programming lessons that can be modified or adapted for use with various types of curriculum and robotics kits. PTD Engagement Checklist (Children) and PTD Engagement Checklist (Environment/Facilitator) – The PTD Engagement Checklist is based on the theoretical foundation of Positive Technological Development (PTD). The goal of the PTD checklist is to provide a lens into how children are engaging with the behaviors described by the PTD framework. Curriculum Starter Materials: Looking to create your own robotics curriculum? Here you will find all the materials you need, from planning and brainstorming worksheets to classroom teaching aids and assessments. The following curriculum units were developed for the KIBO robotics kit (or an early prototype KIBO called “KIWI”) by the DevTech Research Group at Tufts University. These units are designed for children in Pre-Kindergarten through second grade to playfully learn robotics, programming, and engineering in a hands-on and developmentally appropriate way. These units teach technological content while also integrating other foundational early childhood content such as literacy, math, social skills, and more! The curriculum Patterns All Around integrates mathematics with fundamental engineering and programming concepts. Throughout the curriculum, students learn about different types of patterns using mathematics. After learning about the patterns, students then have the opportunity to create a class quilt using KIBO! The curriculum Who Am I integrates identity, culture, and diversity with fundamental engineering and programming concepts. Throughout the curriculum, students learn about their cultural background, as well as the backgrounds of other students, and then create robotic representations of themselves to express their culture in a creative way. Integrating the natural sciences with robotics and engineering, children explore animals and their habitats in the curriculum Robotic Animals. After choosing an animal and researching about its behavioral and physical characteristics, students create a robotic representation of that animal and its habitat. Inspired by the book Where the Wild Things Are, this curriculum incorporates literacy and robotics. During the final projects, students work alone or in groups to recreate the “wild rumpus” by programming their KIBO robots to act out this iconic scene in the book. Over the course of several weeks in the curriculum Dances from Around the World, students will work alone or in groups to build and program a robot to demonstrate their understandings and ideas related to the robotics and programming concepts they have mastered as well as a cultural dance of their choice. During the course of this final project, students put to use all the concepts learned during previous lessons but transfer them to a new context. When projects are complete, there can be a showcase of student work for parents, siblings, and schoolmates. Based on Robert Louis Stevenson’s novel, Treasure Island, this curriculum will incorporate literature and robotics. Inspired by the novel, students will learn about the story through specific events and characters through KIWI robotics. The basics of robotics and programming will be expedited in order to accommodate for more thorough lessons on sensors. This curriculum entitled “Everyone Feels” uses robotics as a tool for developing emotional competency in kindergarten students. To achieve this, it takes a peace education approach, specifically focusing on social-emotional learning competencies. This curriculum is intended for kindergarten students who have been previously exposed to robotics in the past using the KIWI robotics construction kit. Students will work independently and in large group settings to create a robot that expresses their feelings, after reading and discussing “The Feelings Book” by Todd Parr. contains foundational physics connections related to motion, light, and friction. Sensing the World Around Us is an intermediate curriculum for students who have completed the How Things Move curriculum (or equivalent). This curriculum builds on the introductory concepts students have mastered and takes and in-depth look at how sensors work, particularly the three KIWI sensors: Light sensor, Distance sensor, and Sound sensor. Additionally, this curriculum makes foundational biology connections related to animal/human senses, and characteristics of different animals. Over the course of several weeks, students will work alone or in groups to build and program a robotic animal (with sensors) to demonstrate their understandings and ideas related to the robotics and programming concepts they have mastered. To participate in research involving KIBO visit our Get Involved page.